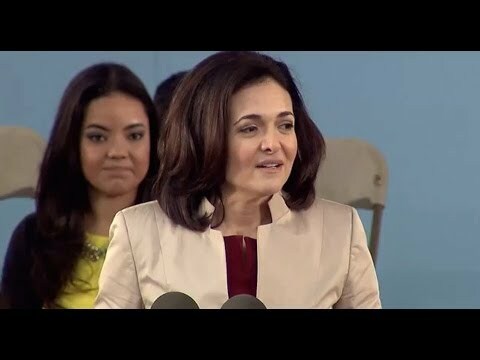 "There is no straight path from your seat today to where you are going," Sandberg told College seniors. "Don’t try to draw that line." In one of their final events together, Harvard College seniors huddled over hot beverages at Tercentenary Theatre Wednesday afternoon as they also drank in some clear-eyed wisdom about confronting hard truths, delivered by corporate executive and author Sheryl Sandberg during the annual Class Day ceremonies. The chief operating officer at Facebook, Sandberg ’91, M.B.A. ’95, is best known to the public as the author of “Lean In: Women, Work, and the Will to Lead,” an influential 2013 best-seller-turned-cultural-phenomenon that urged women to step confidently into leadership roles. The book ignited a spirited international conversation about feminism and the workplace. Sandberg is a highly visible and vocal member of a growing coterie of powerful women who head global brands in technology and manufacturing from executive suites historically reserved for men. Before joining Facebook in 2008, Sandberg was vice president of global online sales and operations at Google, and held senior positions at the U.S. Treasury Department and the World Bank. “Yes, there are women who run Fortune 500 companies — 5 percent, to be precise — but our road there is still paved with words like ‘pushy’ and ‘bossy,’ while our male peers are ‘leaders’ and ‘results-focused,” she said. Recounting a favorite sign in the office that reads “Nothing at Facebook is someone else’s problem,” she said, “I hope you feel that way about the problems you see in the world, because they are not someone else’s problem. Gender inequality hurts men along with women. Racism hurts whites along with minorities, and the lack of equal opportunity hurts all of us from realizing our true potential. She recalled her arrival at Harvard in the fall of 1987 as a freshman from Miami with big hair and white leg warmers. She thought she was destined for law school. “I knew exactly where I was headed; I had it all figured out,” Sandberg said, noting that less than 18 months after graduation, she ended up at Harvard Business School and never had truly envisioned where she is today. 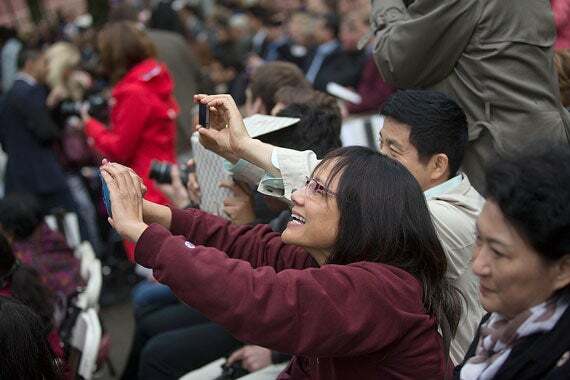 Facebook COO, author, and Harvard alumna Sheryl Sandberg ’91, M.B.A. ’95 addresses graduating seniors at Harvard’s Senior Class Day ceremony on May 28, 2014 at Tercentenary Theatre. In his last address to students, interim Dean Donald Pfister reflected on his time chatting with and advising students, attending their performances, firing off emails to them and, when some looked like they could use a cupcake, happily bringing them a few. “What we are certifying, and my deepest hope, is that as you go out from Harvard, you will indeed advance, promote, and serve,” he said. Rakesh Khurana, the Marvin Bower Professor of Leadership Development at Harvard Business School, professor of sociology in the Faculty of Arts and Sciences and co-master of Cabot House, will become dean of Harvard College in July. Along with Sandberg, Harvard orators Adam J. Conner ’14 and Christie L. DiSilvestro ’14, and Ivy orators Zachary W. Guzman ’14 and Jenna D. Martin ’14, spoke of their Harvard experiences. Majahonkhe Shabangu and Sarah Rosenkrantz were named winners of the Ames Award, an honor given to a woman and a man in the senior class whose displays of heroic character and enthusiasm in helping others had gone unacknowledged. The award is given in memory of Richard Glover Ames and Henry Russell Ames, Harvard students and brothers who perished while trying to save their father, who had fallen overboard during a storm off the coast of Newfoundland in 1935. 2014 marks the 25th anniversary of the Centennial Medal, first awarded in 1989 on the occasion of the 100th anniversary of the founding of Harvard’s Graduate School of Arts and Sciences. This year, the medal is awarded to Bruce Alberts ’60, Ph.D. ’66 (clockwise from left), Judith Lasker, Ph.D. ’76, Leo Marx ’41, Ph.D. ’50, and Keith Christiansen, Ph.D. ’77.